We enjoyed plenty of restaurants over Spring Break. I wish I could say we were having fun at a sunny resort, but our water heater sprang a leak and left us without hot water for six days. After staring at menus the past week, my mind has been on kids, restaurants and diet quality. Here’s my 10-second message: The more often you go to restaurants, the more strict and choosy you need to be. If you hardly ever go out (and make most of your food from scratch), it really doesn’t matter what your kids order at a restaurant. If that sounds like you, you’re in the minority. Most kids consume close to half of their calories from a combination of take-out, drive-through, traditional sit-down, frozen yogurt, coffee/juice bars and more. However often you eat out, take out or drive through now, let’s just assume you’ll keep the same frequency. I’d like to provide 6 new real-world strategies you can use next time you walk into a restaurant. Start Smarter: As soon as a waiter comes to your table, order a starter of fresh fruit and vegetables. Accept anything they have, from carrot sticks to cucumber slices to bananas or melons or berries. Edamame are a great choice and fun to eat. You’ll quickly discover which restaurants are health-conscious enough to provide these choices. CPK, for example, receives all of their vegetables preshredded in bags—our waitress told me they could not even serve a carrot stick or sliced cucumber. Very disappointing. Cheesecake Factory, on the other hand, gladly offers sliced bananas to tiny tummies. Another option is to order yourself a salad with the dressing on the side, then give the kids some of the veggies from your salad. How amazing would it be if a restaurant could offer a $2 starter of cut fruit and vegetables? Almost every parent I know would order this. The Great Re-plate: Research shows that we eat more from bigger plates and even serve ourselves more with bigger serving spoons. Kid plates come atop a mountain of starchy carbs (pasta/fries/rice/potatoes). Re-plate it yourself, adding fruit/veggies, the protein item, and less of the starchy carb. Take it To-Go: Take food to-go and eat at home more often for two big benefits. First, sitting at a restaurant for over an hour is counter-intuitive to kids’ natural instincts to run around and play. Rarely do my kids sit at the dinner table at home for more than 20 minutes. They’re captive at a restaurant: waiting for the menus, waiting to order, waiting for the food, waiting for the check. They won’t be sitting so long at home. Second, you can boost the nutritional quality of the restaurant food by putting out fruit and vegetables at home and serving the restaurant meals on smaller plates in appropriate portions. In under two minutes you can vastly improve the restaurant meal quality—at home! Branch Out: Are you afraid to try restaurants without a kids’ menu? My older daughter first tried steak when we went to a NYC restaurant that did not cater to kids nor offer a kids’ menu. It worked out great for us—she tried and loved steak. If you never venture from the standard burger/mac n cheese/grilled cheese/quesadilla model, the kids will happily stick with their favorites. If they’re hungry and have no standard kid-food option, they may surprise you. If you think ordering healthier at restaurants will be more expensive, you’re right. You can’t have it all: convenience, cheap prices and healthy foods. A bowl of berries costs more than a mountain of fries. If you intend to go out frequently, however, spending a little bit more can make a big nutritional difference. The more often you go, the more care you need to take. Be choosy, set limits, explain those limits ahead of time, and leave room for the kids to make reasonable choices. As a registered dietitian, Chef Beth specializes in weight management, diabetes and a variety of other children’s nutritional concerns. 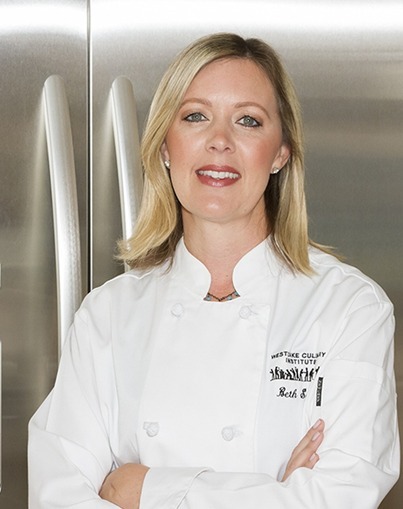 As a Woodland Hills, California Chef, Beth teaches cooking classes emphasizing easy, nutritious family meals.